Su Lin: YIKES! A Fat Cat monk in a pot! Su-Lin: DIM SUUUN, DON'T LEAVE YOUR SOAP LYING IN THE HALLWAAAAYS!!!!! Su-lin: You, you mean we're NOT on any world map that you can find?? Su lin:HEY!? Who called Bob Vila? I didn't want the people from 'Home again' to renovate my house! Su-Lin: The prohecy has been fulfilled! Someone's ruined all of my brother's argile sweaters! Su-Lin: "Iiiieeeee! Something furry - with claws! - ran up my leg!" 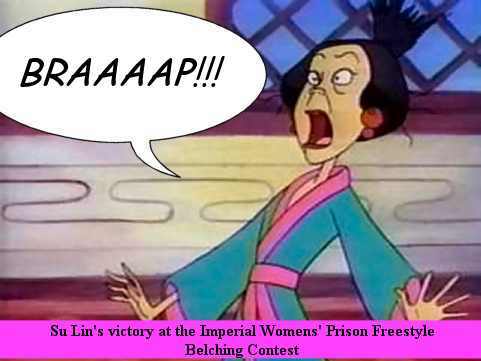 Su Lin - I said WHAT in the dub?!? Su-Lin: AAAHHH, who put a medusa head on my statue!! Su Lin: AAAAAHH!!! Look what the "Clone War" cartoons animators did to my hair!!! Su Lin: You spent WHAT? Why didn't you just rent the tape like a normal person?